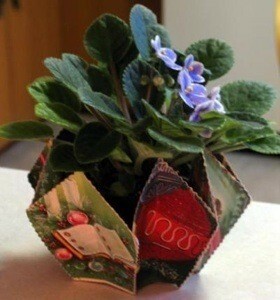 Recycle greeting cards to make a colorful holder for a potted plant. For a flower pot that is approx. 4 inches in diameter, cut 14 pieces of pattern A from the fronts of cards and 7 pieces from the backs for "fillers". Stack them into 7 groups, with patterns showing at the front and the back and a filler in the middle. 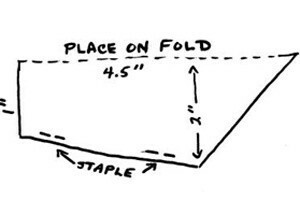 Fold each of the 7 groups to the inside down the middle. Staple sides as shown and slip flower pot inside. I've always loved projects made from old cards. Thank you for another inspiration.